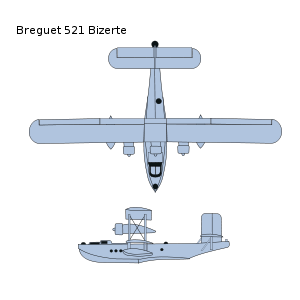 The Breguet Br.521 Bizerte was a long-range military reconnaissance flying boat built by the French aviation company Breguet. A biplane of all-metal construction, with three engines mounted in nacelles between the upper and lower wings, the aircraft was a development of the Breguet S.8/2 Calcutta, which itself was a militarised licenced version of the British Short S.8 Calcutta. It was built to meet a French Navy specification for a long-range flying boat issued in 1932, with the prototype first flying on 11 September 1933. A series of small orders for production Bizertes were placed, starting with an order for three in 1934, with the last order, for 12 (nine of which were later cancelled) being placed in September 1939.. In 1935 a civil version - the Breguet Br.530 Saigon - was produced. After the first flight in September 1933, 34 aircraft were produced, which served with five squadrons of the French Navy from 1935 until 1940. Two squadrons remained in service with the Vichy Navy after the armistice. When Vichy France was occupied by the Germans following the Allied invasion of North Africa in November 1942, several were captured and operated by the Luftwaffe as Air-Sea Rescue aircraft. Following the Allied Invasion of Southern France in August 1944, one of the Luftwaffe Bizertes was discovered by French forces and used for communications duties until spares ran out . Breguet 521.01 Prototype. Breguet 521 Bizerte Long-range flying boat Breguet 522 Re-engined version of Breguet 521. Three Hispano-Suiza 14 AA radial engines. One built. Breguet 530 Saigon Civil version of the Breguet 521. Three Hispano-Suiza 12Y liquid-cooled inlines. Two built. Donald, David (Editor) (1997). The Encyclopedia of World Aircraft. Aerospace Publishing. pp. 189. ISBN 1-85605-375-X. Green, William (1968). Warplanes of the Second World War, Volume Five, Flying Boats. London: Macdonald. pp. 6-9. ISBN 356 01449 5. Breguet 521 Pictures and Breguet 521 for Sale.